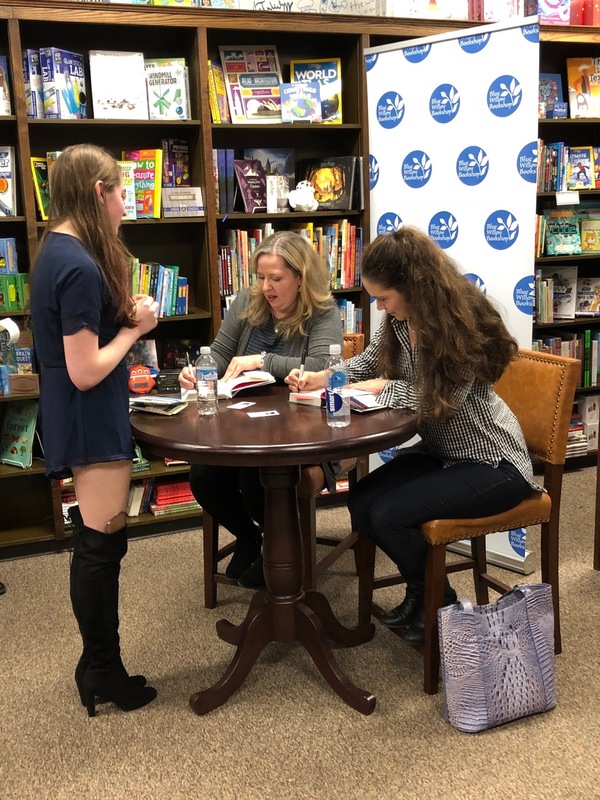 Yesterday, I had the chance to go to Blue Willow to see Alley Carter and Jennifer Lynn Barnes speak. It was perfect timing because I'm flying out tomorrow and would have been crushed to miss them. While I have yet to read any of Jennifer's books, Alley was the author that helped me transition from the world of Middle Grade into YA. Her YA voice with more toned down content is the perfect first step into more teenage books. Over the course of the speaking session, Jennifer shared about her new series featuring a group of debutants and their misadventures. She discussed how the book ended up being more personal than she first anticipated. In one scene, where a character is duct-taped to a chair, she pulled from her own personal life. In high school, when she was the only girl in physics C, she got left in the boys bathroom with all of her limbs bound to the chair. Luckily, a past of reading Nancy Drew books helped her work her way out of it, and the story earned a place in her latest book Little White Lies. Ally, who is promoting her latest book Not If I Save You First, answered a fan question about the origin of her beloved Gallagher Girls series. Apparently, readers have a misinterpretation of Jennifer Garner's TV show Alias to thank. After Ally got a phone call from her agent about the emerging YA trend, she sat down to watch some TV while she brainstormed. With the volume low, a few glances at the screen led her to believe that Garner's character had gone to a spy school. When she turned up the volume, she realized that she had mistaken the story, but she uncovered an area of the spy world that hadn't been explored before. For those of you looking for writing advice from the pros, these two had plenty. On the subject of querying, they advised that you make sure that you follow the instructions to a T, keep you letter brief (half a single spaced page), and start a new project before you jump into querying. Having your heart in another project can help lessen the blow of the inevitable rejections. If you want more advice from them, Ally's next book Dear Ally will feature her advice to teens wanting to write a novel, and feature guest contributors including Jennifer. I can't wait to read their latest books!